I love large pens. However, it is difficult to determine the relative size of a pen online. 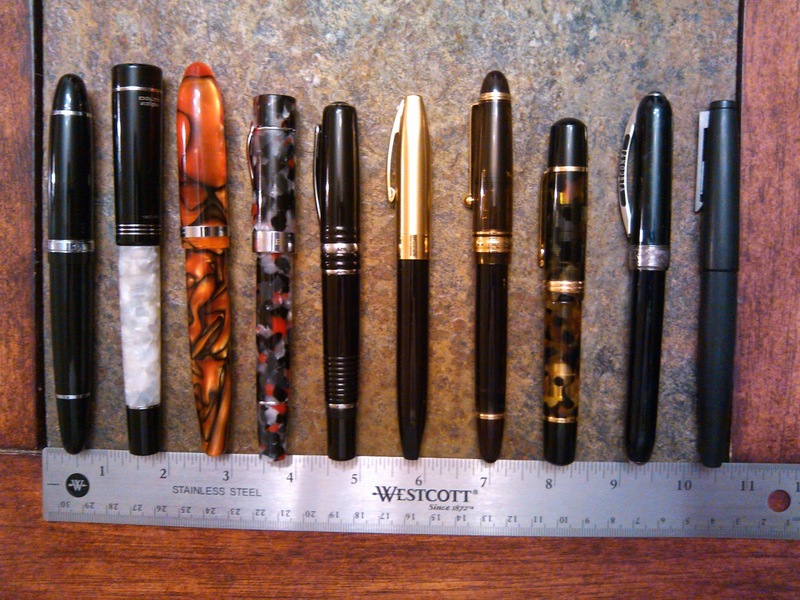 So, here is a somewhat random assortment of my favorite large pens together for size comparison. They are listed left to right: (1) Jinhao 159, (2) Delta Scrigno, (3) Laban Mento, (4) Levenger Boulevardier, (5) Libelle Siena, (6) Sheaffer Legacy, (7) Pilot Custom 823, (8) Bexley Poseidon, (9) Visconti Rembrandt, (10) Lamy 2000. If you had never held any of these pens, by looking at the photo, you might think the Libelle Siena or Sheaffer Legacy are relatively small pens. But they are both fairly large. They just look small next to the Jinaho 159, Delta Scrigno and Laban Mento, which are simply immense.